Interesting... is there a dump of the TEX Tos around? lotek_style wrote: Interesting... is there a dump of the TEX Tos around? It's on SuperGAU User Disk 114 - that's where I got it for my TOS special for ST-Computer magazine. anybody know which of the rom dumper tools who make the ripps compatible with our emulators? As I have a special Tos in one of my ataris. which I belive could be handy. What kind of improvements are there? Might it be on a different disk? Nice. Thanks! Any clue who coded the improvements? AdamK wrote: What kind of improvements are there? 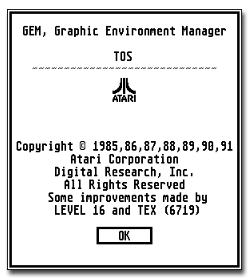 At the Coding Convention, we also hope to get our hands on a new version of the ST TOS (TOS 1.7) that was made by TEX, TNT Crew and Level 16. It is very good, all Atari patches have been included and many more things have been added that now no longer require you to have loads of little programs installed in your AUTO folder. My message wasn't meant as a reminder. I was just quoting you and refering to the other thread. Thanks for the new link .